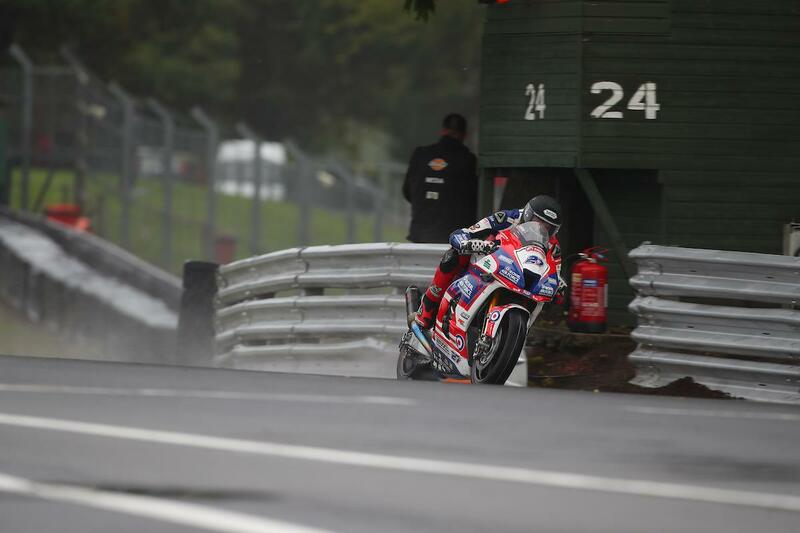 Jake Dixon put on a wet weather masterclass to take his first victory since Knockhill in a sodden opening Bennetts British Superbike race at Oulton Park while title rival Leon Haslam fought through from the back of the grid to finish third. The race start was delayed when Glenn Irwin stalled on the grid, meaning he’d have to start the shortened 16 lap race from the back. Starting from pole position, Dixon got away well off the line but it was MotoRapido Ducati’s Tommy Bridewell who led into turn one. The outspoken Devizes rider looked comfortable at the front, pulling a 1.2 second lead over Dixon in the early stages. However, the RAF Regular and Reserve Kawasaki rider upped the pace to close Bridewell down towards the mid-point, eventually finding his way past into Old Hall corner at the start of lap seven. Starting from the last row after an engine issue in qualifying, Haslam bolted off the line and was 11th at the end of the opening lap. Progressing through the pack lap by lap, he’d find himself chasing down Honda’s Jason O’Halloran for the final rostrum spot. Be Wiser Ducati’s Andrew Irwin enjoyed an impressive run to fourth ahead of Michael Laverty despite a few twitchy moments towards the end of the session while early podium contender Jason O’Halloran dropped back to sixth. McAMS Yamaha’s Tarran Mackenzie crossed the line seventh ahead of Showdown contender Peter Hickman while James Ellison and Dan Linfoot completed the top ten. Bradley Ray’s showdown got off to a tough start as he narrowly avoided crashing at Lodge, running on into the gravel and moving from sixth to 11th place while fellow championship contender Josh Brookes crashed out of fifth. Glenn Irwin would eventually finish 12th after starting at the back. Having set the fastest lap of the race, Dixon will start the second race from pole position ahead of Andrew Irwin and Michael Laverty.